People like to draw fine lines. Pleasure and Pain. Love and Hate. Genius and Madness. For this reason, there is something reassuring about A Beautiful Mind. Here is a story of an extraordinary mind that cannot properly filter delusion from reality -- how comforting. People who like Forrest Gump and the Dumb and Dumber because the foolish are so ... less than us; demand a terrible cost for John Nash and the Smart and Brighter. To be shown (deliberately or accidentally), or worse told, that one is mundane is a great affront. For this great price must be paid. 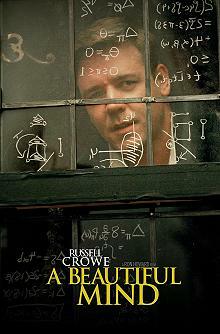 John Nash (Russell Crowe) is ungainly, unversed in human forms, direct and uncompromising in vision and speech. At Princeton he rejects lectures and books by those he considers of faulty thought and discovers his personal holy grail -- the original sound thought. In the years between the promulgation of that idea and his 1991 Nobel Prize, Nash and his family paid a high price. Nash proved to be mentally gifted and mentally ill. He is a man looking for mathematical truth whose own brain is lying to him. A Beautiful Mind takes us into the subjective reality of Nash while still enabling us to see how he appears to others. The film is finely balanced between the world of academia and mundane life, between mocking mortals and recognised brilliance. Written by Akiva Goldsman from Sylvia Nasar's novel, and directed by Ron Howard, A Beautiful Mind features a strong cast including the ever-wonderful Ed Harris. This film does an excellent thing -- it takes the audience into another life and helps us measure our own peculiarities. A moving experience that lets us see for ourselves. Ed Harris also appears in The Abyss; The Firm; China Moon; Needful Things; Milk Money; Just Cause; Nixon; The Rock; Absolute Power ; Stepmom , The Third Miracle ; Pollock; The Hours; Winter Passing; Cleaner ; National Treasure: Book of Secrets; Appaloosa and more!